Don’t miss out on our 18th Annual spring Parking Lot Sale. This one promises to be a big one as we are coming off 2 consecutive good ski seasons and everyone wants new Ski Gear( or Snowboard). We have lots of it and some good used Ski and Snowboard Gear as well. Why is this Parking Lot Sale such a big deal? Well, right after the sale we start packing. Packing up to move shop. We have been in our current location for 30 years and have to admit we have outgrown our space. We are packing up to move down the street and around the corner to Pemberton Avenue. Give us a hand in our move by helping us to move merchandise, before we have to start packing boxes. There will be great deals on Ski Jackets (from $99), Skis (from $199), Helmets (up to 50% off), and the list goes on. 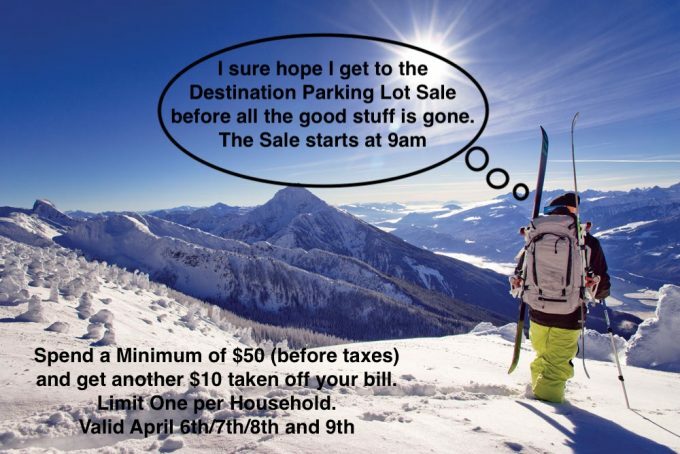 The sale starts at 9am on Saturday April 7th, in the back parking lot of the Destination Slope and Surf, Vancouver’s Favourite Custom Bootfitters.